This year's Libre Graphics Meeting will be in Saarbrücken, Germany, May 29 to June 2. I'll be giving a workshop about comic book workflows with open source software. We'll discuss best methods and software for making comic books, from the sketching and illustration phase to the printing phase, whether actual print or the web, using a variety of software (including Laidout). To that end, here are a couple of new features in development that may help. You may now apply editable clipping paths around objects. Attach and detach paths that clip the objects by selecting a path and the object, then right click to choose how to clip. The clipping path once applied can also be edited in place. If you select two paths, then the context menu gives you the choice of which should clip the other. Related to clipping, and also new is a better tracking of how objects stretch over onto other pages. Now, when an object crosses page boundaries in the Page View, the Singles and Paper views will now properly show the clipped objects that overlap with the current page. At the moment, only objects on pages immediately adjacent will display correctly, so crazy polyhedron unwrappings that are several pages across do not (yet) overlap correctly in Paper views. Sorry, your browser doesn't like this video! This is a new exporter that lets you immediately export your book pages to a static html file. Previously in my own work, this was a completely different, finicky step I needed to go through to publish comics to the web. Now with this, directly from within Laidout, I can render and output page images with thumbnails right into a static html gallery. You may define your own html template to accept your images as well. At the moment, the node tool only lets you change Laidout object transforms, but this tool will, in the fullness of time, become more integrated into many features of Laidout, to allow easier editing of parametric objects, and potentially animation. It is also a testbed for a new plugin backend by way of Gegl based nodes to allow access to a variety of image processing abilities in a convenient node based interface. Previously, the save button only saved. Now that button is a menu that lets you Save, Save As, Save a copy, Save a copy with an incremented number, Save as a template, or Save as the default template. Also in this menu are some settings to control automatic backup settings, to auto save after a specified time. Numerous bugs are fixed, and fresh new bugs introduced, for instance by using Harfbuzz and Freetype for the text tools. This allows much greater font support internally, though much work still needs to be done in Laidout to adapt the new text framework to export nicely to various file formats. At this year's Libre Graphics Meeting, I’m happy to say node based interfaces had a strong presence. For instance, Neil Smith demonstrated Praxis Live, including live music through a mix of code and nodes. Antonio Roberts performed “live noding” with nodes in Pure Data, manipulating 3-d structures together with music in real time. After this meeting, which included interesting talks with devs from Gimp, Inkscape, and others, Laidout now has many more things on it's node to-do list! Speaking of to-do lists, thanks to everyone who came to my node workshop, we found several bugs which are now all fixed! In other news, I hope to have a new "stable" version of Laidout released within a finite amount of time. I've narrowed down my task list to about 50 or so bugs and usability issues to clear up before then. Hopefully this will only take a few weeks, as long as I can stick to that list and not implement new tools instead! Laidout is desktop publishing software built from the ground up with imposition in mind. Currently one may arrange pages into various cut and folded impositions, such as a booklet, or even a dodecahedron. You can fill pages with images, gradients (linear, radial, and mesh), mesh transformed images, engraving-like fill objects, and some basic text. Export with varying degrees of success to Svg, Scribus, Pdf, and more. See the Laidout Features page for more detail about what it can do now, the Roadmap for what it's supposed to do eventually, and this (incomplete) comparison to a few other desktop publishing and vector graphics programs. It is in the "Mostly does what I want on my machine" stage of development. I try to have a new "stable" release once in awhile, at least when various other projects don't eat all my time, which seems to happen a lot lately. "Stable" in this context means that it is only slightly less buggy then the raw development branch. I have been using Laidout to lay out my comics into books since 2006. So, one out of 7 billion people agree that Laidout might actually be useful! For example, one can make small booklets by chopping up tabloid sized paper (11x17 inches). With a fold, two cuts, and stapling, one can make three cute little 5.5 x 5.6 inch books. Many more features are planned, like such non-essentials (to me anyway) as flowed text boxes. Who needs text when a picture is worth a thousand words? 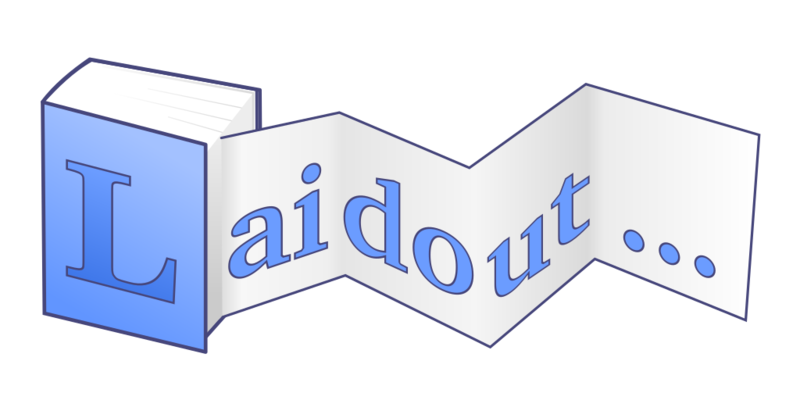 Laidout, together with the Laxkit backend, aims to make a well documented, very modular, expandable, and configurable desktop publishing program, with an emphasis on developing tools not commonly found in other programs, as long as they are useful. A side project is to foster the ability to share these tools with other software. Laidout only works on variations of Linux for now. It should work on Macs after a small amount of hacking, but I don't have access to a Mac to make it so. The current release is Version 0.097. (icons here if necessary). You can help turn Laidout into something stable (without quotes) by posting feedback on your experiences with it to the Laidout mailing list, issue tracker at github, or by dropping me a line. In any case, you can get Laidout in source code form, or as a deb package for debian based amd 64bit systems. The main 0.097 download area is here. Some of the dependencies above (from mesa-common-dev on) are for the unstable polyhedron unwrapper. You don't need them if you disable the opengl based unwrapper by passing --nogl to the configure line above. The unwrapper exists also in a standalone version in laidout-0.097/src/polyptych. Instead of compiling as above, you can build a deb package from the source tar like the following. You'll need to have dpkg-dev and fakeroot packages installed. This will create an installable deb package. If you try this and it doesn't work, please let me know. It is supposed to work!! If you think you might like to help develop Laidout, please see this page. To actually compile from this git source, see the further instructions in the Compiling From Development Git section of the README. You can try Laidout's issue tracker at github, or there is a general purpose mailing list here. Currently, the only developer is Tom Lechner, and he has been hacking away at Laidout to help make his artwork.